20% are selected by „time of waiting“ – that is time since high school graduation (‘TW-group’). Since 2006, Hannover Medical School (MHH) has been conducting selection interviews as an additional admission criterion. Recently, the data of final examination performances are available for the first two cohorts selected by the new admission procedure. Students who enrolled in winter 2006 and 2007 and had been admitted in one of the main admission groups were included into the analysis (N=506), while students from other quotas had been excluded (students who changed university, who were admitted in priority admission e.g. cases of hardship, foreign students; N=73). Figure 1 reflects the composition of the analyzed cohort referring to admission group. The results of examinations held in autumn 2012 until autumn 2013 (considering three independent exams) were included into the analysis. 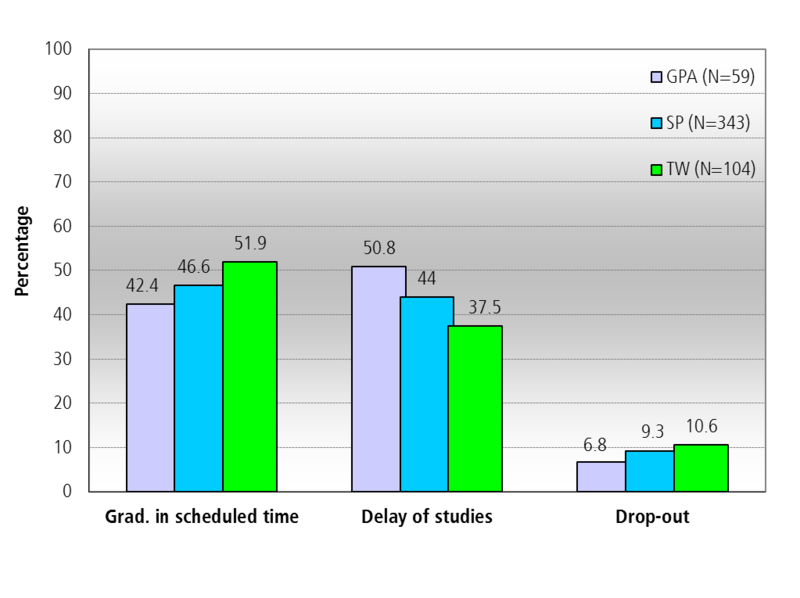 Using one-way ANOVA, we analyzed whether the final examination-grades differ significantly between GPA-, SP- and TW-group. Standard period of study as well as drop-out-rates were evaluated with regard to the admission groups using Chi-Square-Test. 65.4% of students enrolled in winter 2006 or winter 2007 finished their studies successfully, 24.3% are still matriculated and 10% dropped out. The drop-out percentage of students referring to admission-group is shown in Figure 4. 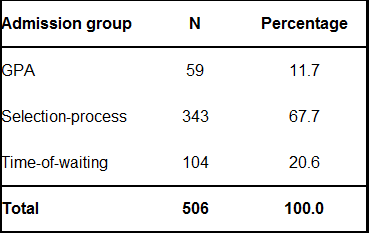 Although students admitted by time of waiting and selection-process dropped out more frequently than students admitted by GPA, the differences were not significant (χ² (2, N = 506) = 0.65, p = .72) (Fig.4). 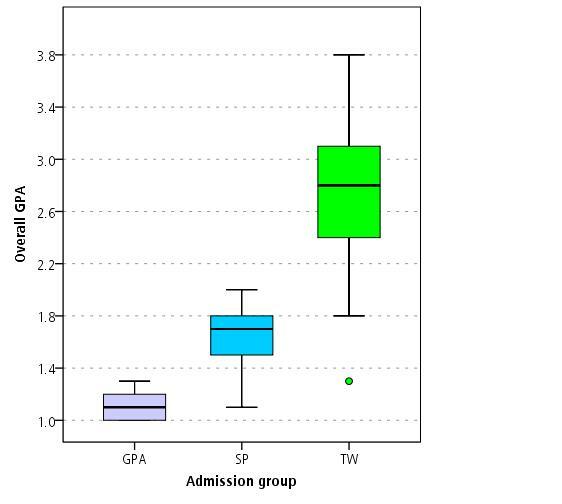 Considering the standard period of study, TW-group students graduate more often within the scheduled time than GPA- or SP-group students (Fig.4), although the differences were not significant as well (χ² (2, N =506) = 1.52, p =.47). 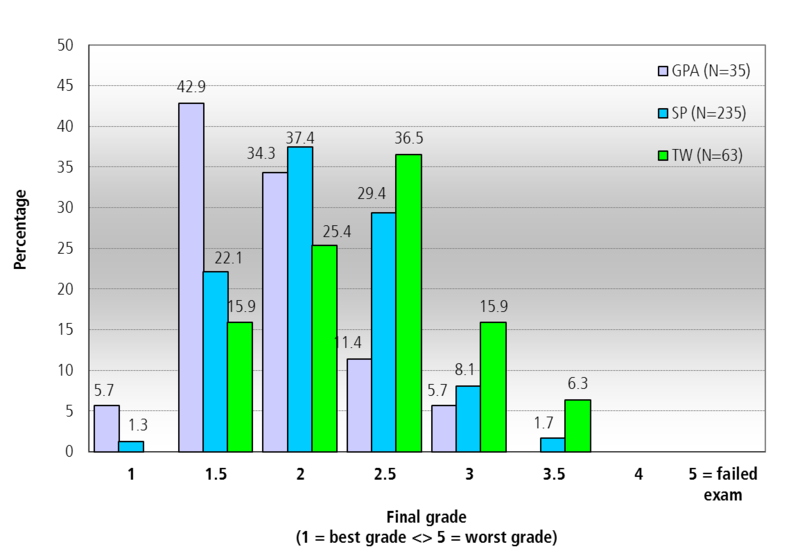 Figure 5 shows the distribution of final examination-grades by admission group. 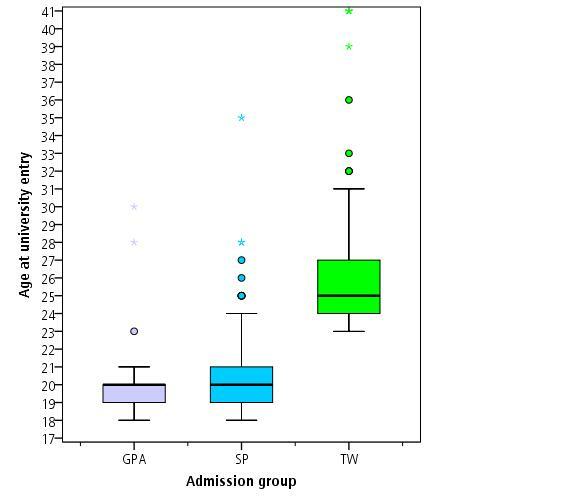 It becomes clear that students admitted by GPA have better final examination-grades than students admitted by selection-process and time of waiting; then again SP-group students have slightly better grades than TW-group students. 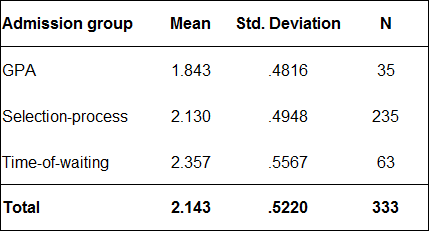 One-way ANOVA confirms significant differences between the groups (F2, 330) =11.893, p<.001) as well as Bonferroni post-hoc-analyses confirms the differences between all admission groups (p<.001 for all group-tests) (For table of mean and standard deviation see more details). Students admitted exclusively by GPA have better final examination grades than students admitted by the other admission criteria. Furthermore they have lower drop-out rates than SP-group or TW-group students. These results are in accordance with a currently published study . Surprisingly, students admitted by time of waiting graduate more often within the scheduled time than students admitted by other criteria. We assume, that GPA- and SP-group students participate more often in doctorate program resulting in prolonged studies, what we want to examine in further research. Students admitted by selection-process fit the gap between those merely admitted by GPA and by time of waiting – whether that is GPA, scheduled time of study, drop-out-rates or final examination performance. Still, the question remains whether the additional value of selection procedures moving beyond taught knowledge and skills can be actually measured by the presented data. Students admitted by selection-process perform better than those admitted by time of waiting, but worse than students admitted exclusively by GPA. Further research is needed for examining the additional value of selection-procedures moving beyond cognitive skills. Kadmon G, Resch F, Duelli R, Kadmon M. Predictive Value of the School-leaving Grade and Prognosis of Different Admission Groups for Academic Performance and Continuity in the Medical Course – a Longitudinal Study. 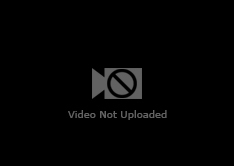 GMS Z Med Ausbild. 2014;31(2):Doc21. Richter I. Selection and Reform in Higher Education in Western Europe. Comparative Education. 1988, 24:1, 53-60, DOI: 10.1080/0305006880240105. 557-61. Spence J. Access to Higher Education in the Federal Republic of Germany: the Numerus Clausus issue. Comparative Education. 1981, 17:3, 285-292. In Germany, admission to medical study programmes is restricted since the early 1970‘s because the number of applicants greatly exceeded the number of available university places. Everyone who graduated from high school has a chance of admission with the greatest possible consideration of individual’s choice of subject and university. In order to realize this claim, „time of waiting“-quota has been established [3, 4]. Since 2005, universities in Germany are approved to apply additional criteria for admission exceeding the mere high-school GPA; 60% students can be selected by this selection procedure. Hannover Medical School established selection interviews in 2006. Interviews are conducted with each individual applicant lasting about 20 to 30 minutes. Issues like career decision and motivation to study or social commitment are addressed during the semi-standardized interview. Due to legal regulations, the selection interview score contributes 49% while GPA contributes 51% of overall selection points, allocating a rank for each applicant. Finally, University places are awarded according to this ranking. Study places that cannot be filled in GPA- or TW-group within a given deadline are awarded to applicants of SP-group. Therefore the final compostion of the analysed cohort referring to admission groups differs from the presented but still is in accordance with law. The following Figures provide further information of the analysed cohort. Figure 2 shows overall Grade Point Average and Figure 3 age at university entry referring to admission group. Those features are characteristic for the three admission groups and differ between them, especially with regard to time-of-waiting group.